There was not much crafting going on this weekend. 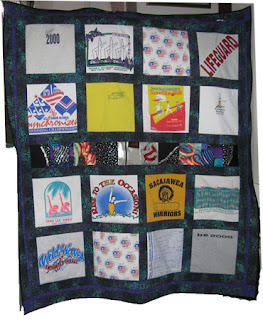 I did however manage to create the binding to put on the T-Shirt quilt I finished. The center bar of blocks are swimsuit blocks. The person was a synchronize swimmer. This is a pretty large T-Shirt quilt. So large, I can't get a good photo of it without it bending and waving on the banister before I ship it out. I machine sewed down the binding to the front and then hand stitched to the back. I'm so glad I finished that this weekend! I'm surprised how much I like sewing down the binding. I'll just sit there and sew until I"m finished. That's a good things because I have two more quilts to be binded that I squared up this weekend as well. It's the Moda lap quilt and the finished UFO in the recent posts. I did get a chance to review the Farmer's Wife block book an it's definitely something I'd be interested in. I just need to wait and see how things turn out this week with dh's appt. I'm already behind in my two BOM's so I need to catch up there as well. Finally, I also cut out a bunch of circles using my AccuQuilt Go. I added them to the mock denim Cathedral window quilt. It's coming along nicely. I precut a bunch of batik fabrics as well to go in each of the circles. I'll take some photos of that for an update tomorrow.